Facebook recently rolled out Facebook Live in 60 countries, and has expanded its features. Launched exclusively for celebrities eight months ago, the real-time video streaming product of the social media giant will go head-to-head against Periscope by Twitter, Twitch, and Snapchat. Facebook Live will allow users to broadcast or live stream videos in real time to their friends, groups or to a bigger audience or in scheduled events. Its features include the ability to add doodles or turn videos into black and white shots. Viewers can react to the videos just like the way they do on Facebook posts. They can simply press on emojis of love, haha, like wow, sad or angry to express their feedback about the live video. 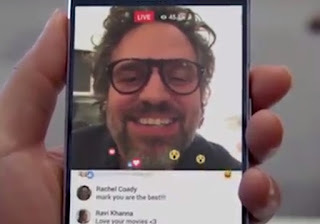 The reactions will also be shown in real time and will float across the screen during the live video presentation, giving both the broadcaster and the audience an idea on how the live video affects most viewers. Users of Facebook Live will be able to see a map of video streams worldwide. Knowing that it would be a daunting task to sort through a massive number of live videos, Facebook will include features that will allow users to easily search them. To make Facebook Live more visible on its app, the Messenger service button will be moved while the new livestream video option will be highlighted on the notification panel. Facebook founder and CEO Mark Zuckerberg gave the best description of Facebook Live on April 6. He said, "It's like having a TV camera in your pocket all the time". Users will be given the "power to broadcast from a smartphone to anyone in the world." Facebook has reportedly paid celebrities to promote the use Facebook Live in sharing videos and answering questions from their respective audiences in real time. News agencies have also tried using the social network's livestream service for providing updates on news and events, especially breaking stories. According to Recode, there are sources which say that Facebook is paying big media companies like New York Times, BuzzFeed, and the Huffington Post, to use Facebook Live to showcase videos. With a very massive base of users and a promise of better features in its updates, Facebook just might take be able to wrestle some users from Snapchat. The image messaging application by Evan Spiegel, Bobby Murphy, and Reggie Brown had grown tremendously in the past few years. Snapchat claims its 100 million users register as much as 8 billion daily video views.